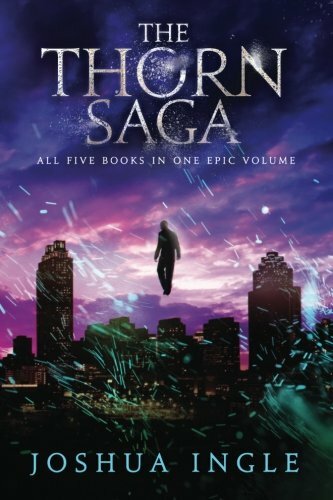 “The Thorn Saga” by Joshua Ingle is a five book series that follows the redemption arc of Thorn, the most powerful demon of Atlanta. In this novel, invisible demons spend their time orchestrating heinous acts to gain prestige among their peers. They are unable to interact with the physical world and instead rely upon their own cunning to manipulate human puppets into war and genocide. This is a novel that turns the phrase “devil on your shoulder” into something literal. “The Thorn Saga” is a heavily character-driven novel that will force the reader to think. Internal conflicts outnumber external ones and the plot itself is a bit on the slow side in the first four books. In the final installment all the pieces come together to paint a perfect conclusion and answer most of the remaining questions a reader may have. That being said, a reader who desires a more action-packed and fast-paced novel should look elsewhere. The first two parts, “Thorn” and “A Demon in the Dark” focus on Thorn both discovering and coming to terms with who he wants to be. “Sanctuary” and “The Devil’s Secret” follow him as he figures out how to be that person, and the conclusion, “A God to Fear” finds him fighting for the right to be an individual. While Thorn’s character development alone is astounding and emotional to read, the journeys of the other main characters are equally profound. Joshua Ingle does a fantastic job demonstrating both internal battles of his characters and the complexities of the different spirit societies. His ideas are unique and innovative, relying on a subtle kind of action. While it pales in comparison to all the positives, some of his world-building contradicts itself. For example, the demons are unable to interact with the physical world. They pass through solid objects they try to touch, but there are several scenes, specifically in the third novel, where they suddenly lose this ability and can be trapped inside rooms. It’s small things like this that undermine the foundations he’s laid down for this world. “The Thorn Saga” is a series I found incredibly rewarding to read. It’s a new take on a common trope and I appreciated the subtleties of the plot throughout all five books. Doing a bind-up of the entire series makes them easier to read and provides immediate answers for the questions raised at the end of each individual book. Anyone tired of the angel/demon tropes we see so often in literature should pick up this book for a refreshing read. A dark, philosophical thriller following the redemption of the irredeemable, “The Thorn Saga” by Joshua Ingle is a fascinating story that will leave the reader questioning what they themselves stand for.